Springtime is the perfect time to divide and transplant hostas. Not only will it help to keep these beautiful perennials healthy and well-shaped, it’s also a great way to add additional plants to your landscape. Hosta plants add big interest to the landscape with their over-sized leaf canopy. The best part of all? It’s easy and quick to do! Digging up plants in the early spring can sometimes be a bit tricky since most are missing their foliage. With a sharp shovel, dig down about one inch back from the edge of the plant. Cut the soil 4 to 6″ deep around the entire diameter of the plant to loosen the root ball. Split down through the root ball with a sharp blade to create new plants. Hostas do not have particularly deep roots, but they can be quite tangled and tightly bound. Once the edges are loose, the plant will lift from the ground fairly easy. Next, use a sharp spade or garden knife to slice off new plant portions from the existing root ball. This is one time where a Hori-Hori Garden Knife comes in handy! Split the plant according to the size of transplants you would like. On average, a two to three inch split creates an 8 to 12″ diameter plant in the first year of growth. The smaller the off-shoots, the smaller the first year plants will be. If you have a large plant and desire more robust first-year off-shoots, simply split the root ball into bigger portions. For extremely large plants, avoid making transplants from the center portion. These areas are the weakest and oldest parts of the plant, and should be discarded. To transplant, create a hole twice diameter and and depth of the cutting. This helps loosen the soil so roots can easily expand and develop. When planting, the top of the crown (where the foliage grows from) should be covered by about an inch of soil. Hosta plants that have already begun to emerge can still be divided. If the hosta plant has already begun to leaf, it can still be divided. They are actually an extremely hardy plant and handle the stress well. Water the new divisions every few days until the new plants have emerged. If you find yourself with too many plants, pot up the extras to use later, or give to friends and family. Hosta plants also make for great container plants on covered patios and porches. Extra plants can be potted to plant later, or give away. The plants thrive in the protected, shady space – and can create an almost tropical feel with their huge leaf canopy. At the end of the season, they can be planted back into the landscape, or stored in a cool, dry garage or basement for the winter. 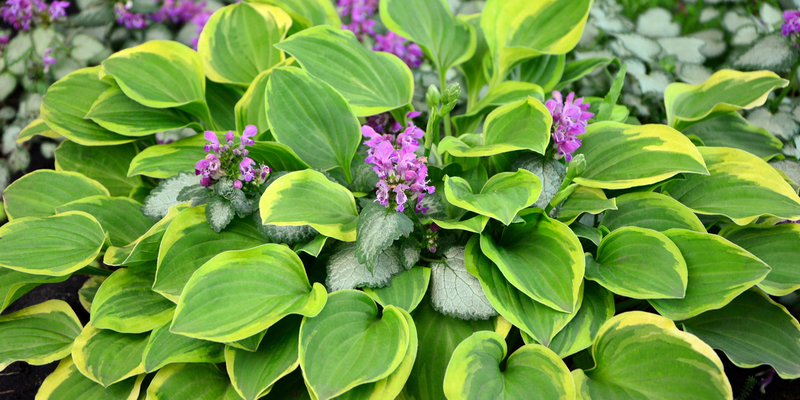 For other perennials that perform well in low-light areas, be sure to check out our article on Shade Loving Perennials.